Free Fire takes the Mexican standoff to new heights of absurdity. It's initially a creative, guns blazing effort. Director/writer Ben Wheatley kindles a motley crew into a Tarantino-esque dilemma. What follows is a bizarre downhill plunge into boredom and dirt. That's right, dirt. This film has all of the characters crawling around like centipedes on the floor for the majority of the runtime. I wish I could say it adds a depth of realism to the gunplay, but it doesn't. It's a gimmick that wears thin fast. I'm sure the wardrobe and make-up department had a field day keeping the cast filthy. Free Fire is set in a Boston warehouse in the late seventies. Brie Larson stars as Justine, a middleman of sorts, setting up a gun deal between the IRA and a gun dealer (Sharlto Copley). The Irish group is led by Chris (Cillian Murphy), a level headed guy with a team of junkies and toughs. Armie Hammer, in by far the film's best performance, plays Ord, the protection for the dealers. The meeting does not go well to say the least. Erupting into a barrage of bullets that has everyone ducking for cover. The first fifteen minutes of the film is interesting. There is a rapid series of introductions that establish the characters and setting. Everyone has snappy dialogue and a distinguishing personality trait. You would think that the action would ramp up once the bullets start flying. It doesn't and that's very strange to me. The characters get bloodied and muddy, slinking around the grimy floor, taking potshots while spewing one liners. It became comical, then sadly boring. Free Fire purposely brings you down, but never picks back up. There's a satirical element to Free Fire that falls flat. The idea of gun runners getting smoked, albeit slowly, by their wares is obvious. The floor hugging resolve feels like an eternity to play through. The setting remains the same throughout, so you're watching actors crawl around in a warehouse for almost ninety minutes. The fun factor fizzes away like a kid's balloon. Armie Hammer keeps Free Fire watchable as the other actors slink. I found their characters lost steam and were one note. This is especially true for Brie Larson's Justine, an ultimately blasé heroine. I think Larson liked the idea of rolling around in the grime and belting out bullets with the boys; but the character is unremarkable. At least Hammer captures our attention and continues to be interesting as Free Fire devolves. From A24 Films and directed by Ben Wheatley, Free Fire is the kind of film that sounds very entertaining. I'd bet the script is a terrific read. But the jump from clever concept to decent movie is a tenuous one. Sometimes the innovative idea doesn't translate fluidly to the screen. 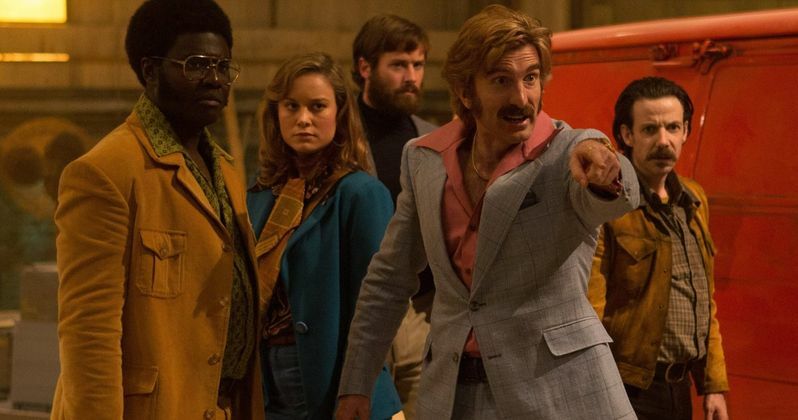 Free Fire has the quirky seventies tone, B-movie set-up, and a skilled cast, but loses the veneer of its high concept. The Mexican standoff becomes a snoozer here.